Musicians, Dj’s, Singers, Rappers – All these Artists use sounds and rhythms to move people’s bodies on the dance floor, or to move their souls closer to the truth through moods, feelings and lyrics. Every Artist we feature here participates in delivering good, quality music. Something we all need to survive & thrive! Indie Singer/Songwriter, Edwin Vazquez, has been making his mark around the NYC art scene for quite some time now, electrifying audiences with his spiritual song lyrics that touch the hearts and minds of people from all walks of life. 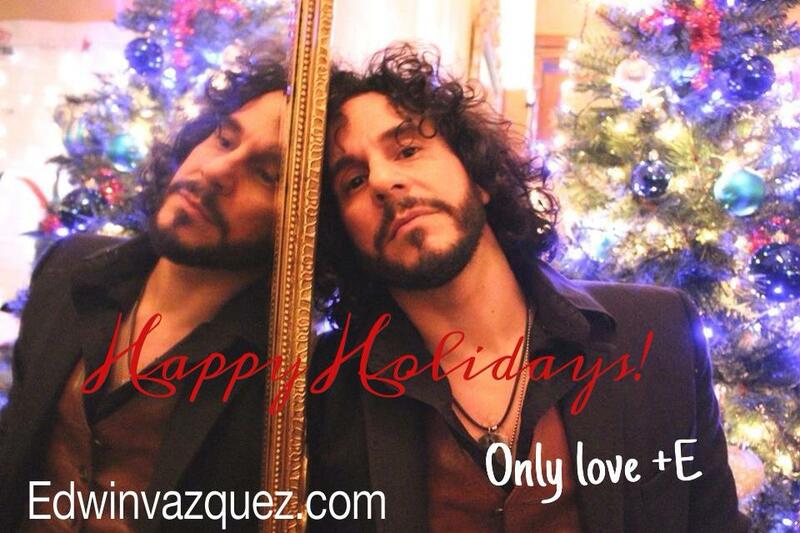 Although he is of Puerto Rican descent, (and has been featured on Telemundo’s El Show de Jackie – one of the largest Latino networks) his music reaches out to Africans, Caucasians, Latinos, Indians and Asians because of his universal messages of love, forgiveness, and compassion for all of humanity… Isn’t that the way to tis the season! For the Holidays, we asked this gypsy soul singer to answer 7 questions so that audiences can get to know the man behind the music. We know that you carry yourself as a Conscious Artist because your songs carry messages of peace and divine truth. But everyone has favorites. Name 3 of your songs that you feel carry the strongest or most important messages. Which major Artists have you collaborated with in the studio or on stage? Describe the synergistic experience. How do you infuse your music into other forms of Art? Example. musicals, commercial jingles, movie scores, birthday parties, etc. What were some of the creative ways you cross marketed with those companies? Do you have Christmas songs? And what is (or was) your religion? How do you personally feel about the Holidays? What is your new years resolution? Where do you envision your career in 2015? Tell us a little about your manager and band members. How do they inspire you and keep you going. What advice do you give to other musicians? And do you believe that we should all be conscious Artists? Are they twin flames? Soul mates? Or just two love birds who were destined to meet for a greater purpose? Both were born worlds apart from each other with Justin having roots from Managua, Nicaragua and Monica from Dallas, Texas. And yet the two found each other in the NYC nightlife scene to later wed on July 14, 2013. Due to Justin’s heritage, he promoted Latin/Brazilian parties for over 20 years in some of the hottest clubs such as The Tunnel, Palladium, and Limelight just to name a few. 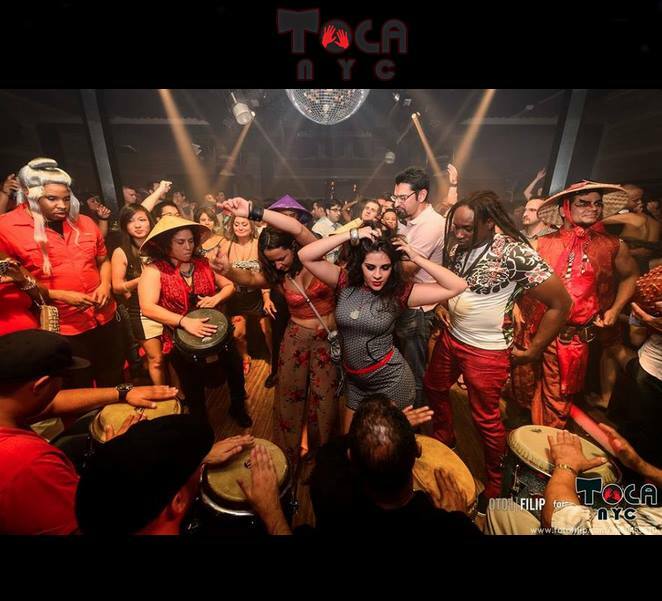 And with Monica’s love for the Arts as a former Theater major and TISH NYU graduate, they combined their expertise and produced “The Toca Cielo Party”. 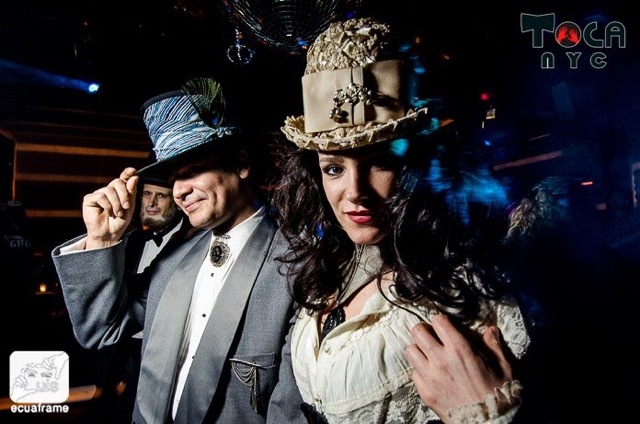 Four times throughout the year, they host a spectacular costume themed party with live drummers, conga players and burlesque dancers uniquely designed to provide a fantasy inspired atmosphere. In addition, they’ve even featured a snake dancer. (Yes! A real live snake). Risque, classy, flamboyant and extravagant – are all words to describe this eclectic vibe of Artists dressed in theatrical attire to unite underneath the umbrella of Afro/Tribal/World House Music and Samba. 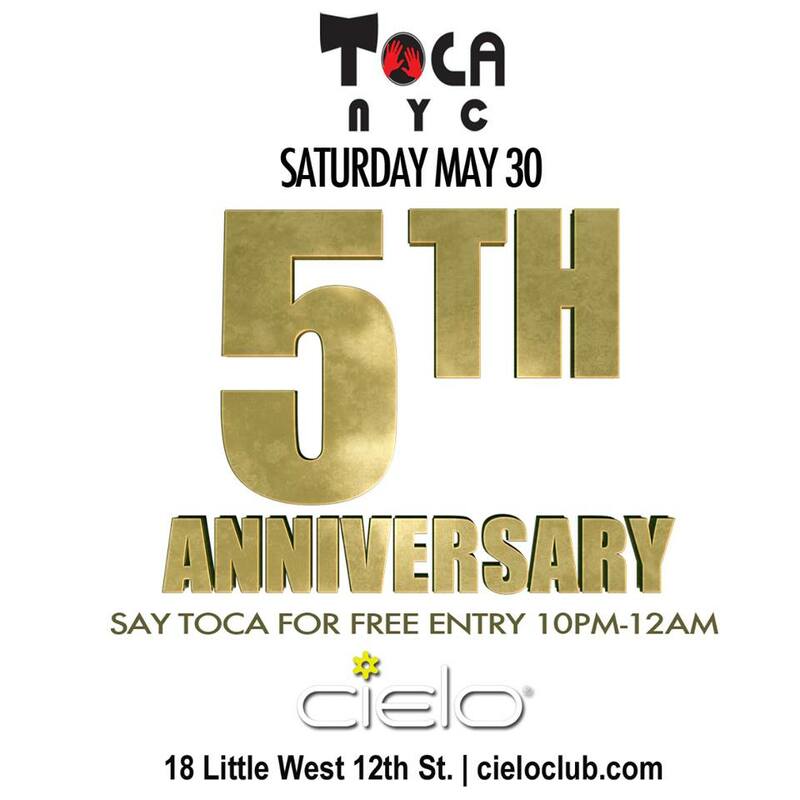 On top of their event reaching its remarkable five year anniversary on the 30th of this May, they’ll also be celebrating the 2nd year opening of their Long Island City, Queens TOCA NYC STORE this Summer. I know what you’re probably thinking? What else can’t this fabulous couple do? They definitely show and prove that the power of two is the secret to success… as everything they touch multiplies! 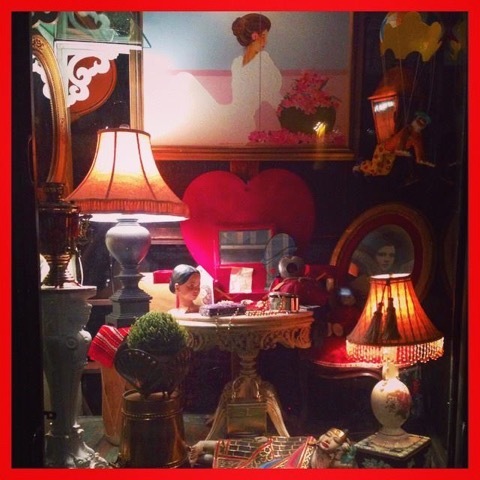 Within walking distance near The Socrates Park and The Noguchi Museum in Astoria Queens, lays their vintage shop which is quickly being recognized as the neighborhood’s treasure chest. Due to the couples love for travel, they’ve chosen unique pieces from around the globe that are rare to come by. Thus, with some of the antiques available for sale, it should be easy to find some beautiful gifts for Mother’s and Father’s Day! Below is a small selection of recommended items. Soulful House Singer, Michelle Rivera, begins her career with a gentle push from an Angel in Heaven. 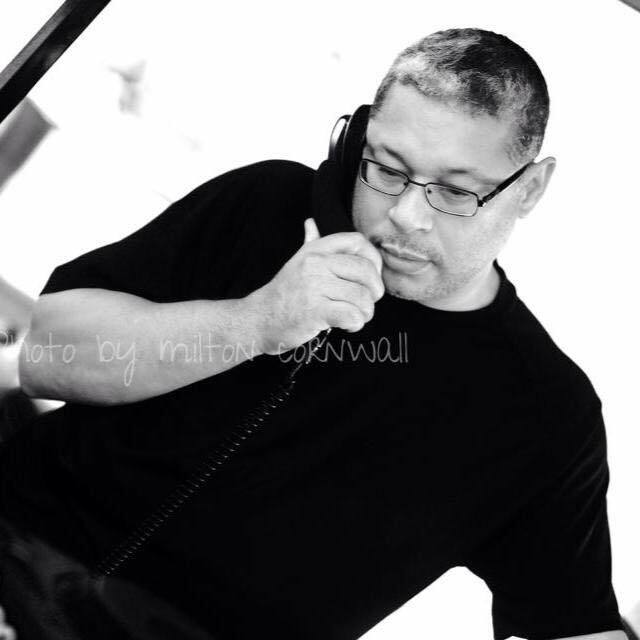 Most would agree that music is a universal language; especially when certain instrumental rhythms pull people onto the dance floor regardless of what color or creed they are. While dancing the stress away, strangers experience ‘togetherness’, jolting their bodies beside fellow party goers. For some, it’s an escape from the pressures of mundane responsibilities as they set their spirit free to ride the waves of exhilarating sound and vibration, and yet for others, (such as professional DJ’s & Singers) creating music is a way of life that becomes as natural as breathing. The beautiful songstress Michelle Rivera wasn’t always a professional Singer/Songwriter who entertained club crowds and music lovers. In fact, she humbly admits that although her new dance singles “Live It” and “Breaking These Chains” are rapidly climbing the charts on Traxsource & Beatport, she’s still just getting used to the idea of calling herself an “Artist” because she’s so new to this part of her life’s journey. Where some Artists have had a head start since childhood or early adulthood like Beyonce, Michael Jackson and many more, Michelle Rivera, had an epiphany to pursue her dreams at an age when most people (especially women), are ready to give up after 40 if they’re not already established in this field. However, for Michelle, it was different. Her divine timing came shortly after mourning the death of her good friend Vivian Rivera to Cancer in 2011. In addition to Michelle’s over night success in the soulful house industry, she continues to pass on the torch in memory of her friend Vivian (who coincidentally shares the same last name ‘Rivera’) in her interviews and even in some of her live performances, such as singing a cover of Vivian Rivera’s last song called ‘Chosen’ at a fundraiser. While Vivian battled her illness (which began with Breast Cancer until spreading into brain Cancer), she found the strength to use her experience as a tool to spread a message of unconditional love to others. In this video, you can see a small clip of her tenacity to go on living and giving hope to others who’ve suffered from the same disease. It’s because of life experiences such as those that inspired Michelle to write song lyrics such as ‘Live It’ produced by Todd Terry on Inhouse Records where she expresses her views on living positively. “They need to believe in love, They need to believe in love. Live it. Love and life. They need to let go of all the hating inside,” she sings.